Photochemistry, or the use of light in chemical reactions, has a number of important applications both in nature and industry. Photochemical reactions lie at the heart of photosynthesis and vitamin D formation, and play important roles in the manufacture of electronic equipment, protective coatings and the synthesis of drugs and fragrances. Traditional batch photochemistry however has fallen out of favour. A number of problems such as safety, the availability and complexity of equipment, the control of reaction conditions and the difficulty in scale-up, limit its use. 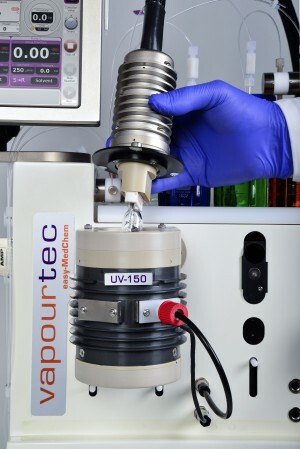 The breakthrough Vapourtec UV-150 photochemical reactor makes photochemistry accessible. 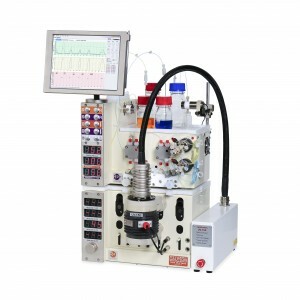 Eliminating the problems of traditional batch photochemistry, the UV-150 reactor allows the full potential of photochemistry to be exploited. 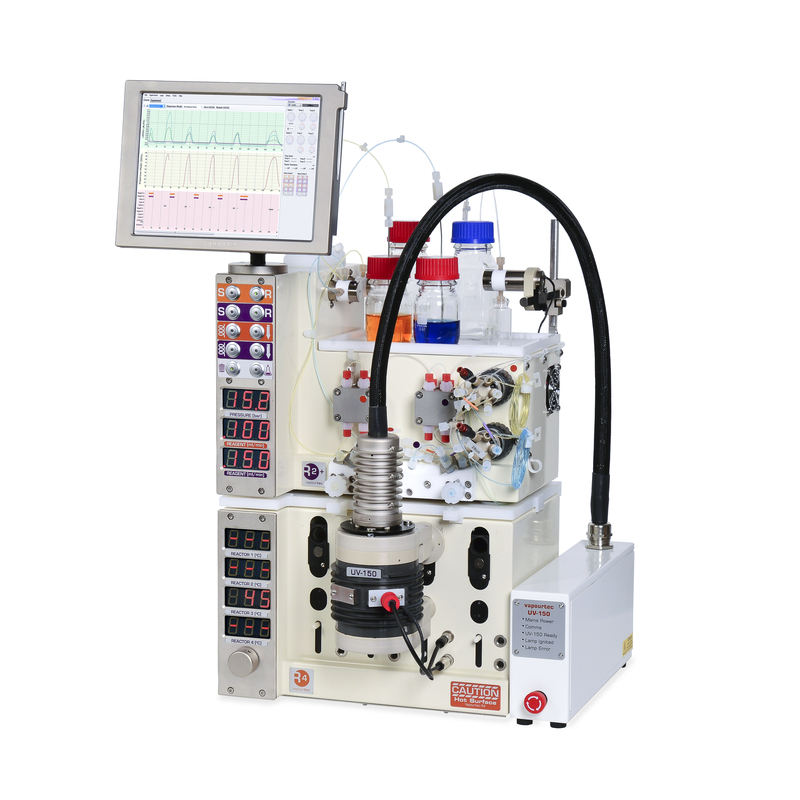 It offers safe, precise, efficient, consistent and scalable photochemistry under continuous flow operation. Compatible with R-Series and E-Series. Interchangeable light sources – all fit in same reactor body. Optional spectrometer for real time transmission spectra. The UV-150 photochemical reactor has been designed to interface with both Vapourtec R-Series and E-Series flow chemistry systems. 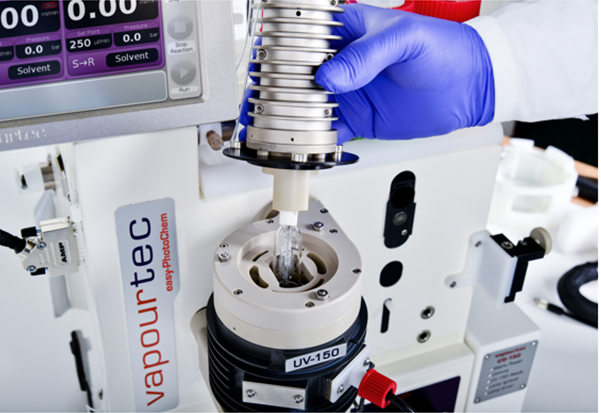 In common with the Vapourtec’s family of reactors, the UV-150 simply plugs into the ports in the system. Connecting the temperature sensor and power supply module completes the installation. Installing and getting a reaction running with the UV-150 reactor takes less than 5 minutes. Vapourtec offer 3 different light sources to offer precise wavelengths between 220nm and 650nm. 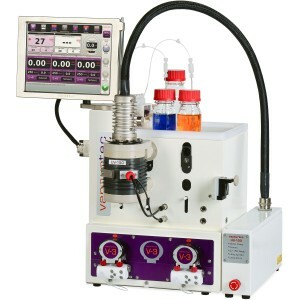 The UV-150 photochemical reactor is designed to give safe and accurate heat management as well as the best possible reaction selectivity. It provides a temperature controlled environment which can be set between -20°C and 80°C. The reactor and lamp are housed in separate, sealed quartz chambers. Air is circulated within each chamber to dissipate heat and then separated exhausted from the system. The high flow rate of gas gives effective temperature control. A dichroic mirror further removes heat from the system and reflects more than 90% of UV energy back into the reactor. The scale-up of traditional batch photochemistry is challenging. 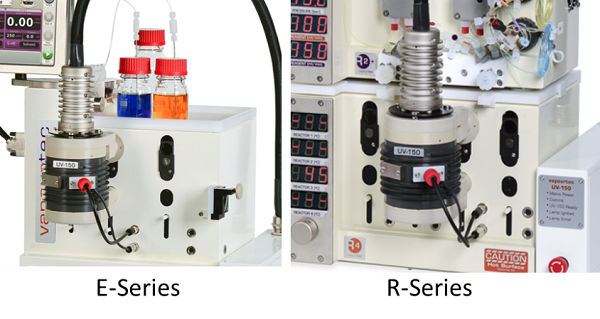 The UV-150 photochemical reactor makes scale-up accessible. The high power of the medium pressure mercury lamp for example, allows the synthesis of multiple gram/hour quantities of material. 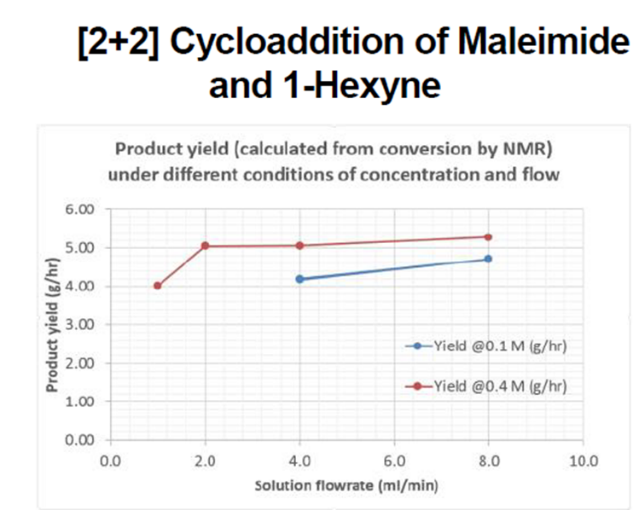 In an experiment to replicate the [2+2] Cycloaddition of Maleimide and 1-Hexyne from published literature, conversions of greater than 5g/hour have been achieved. 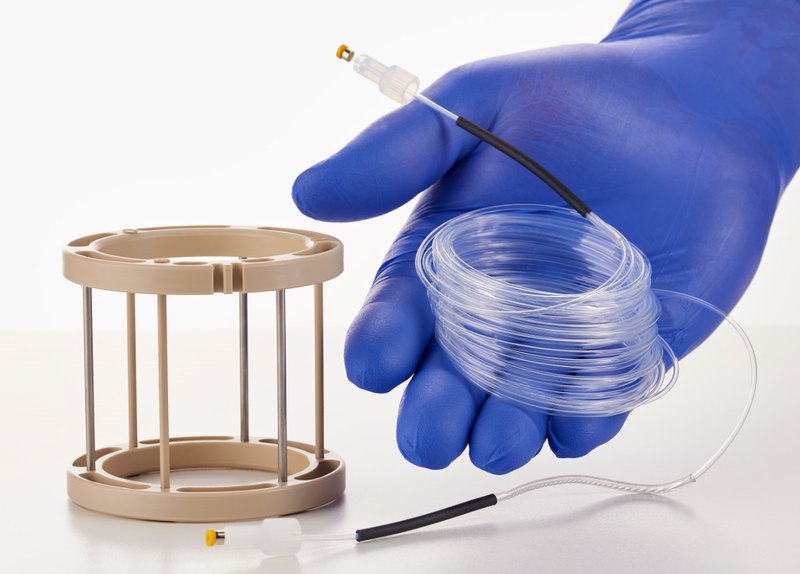 The UV-150 reactor is made from a single layer of thin walled, small bore fluoropolymer tubing. This maximises the absorption of light photons by reagents. Tubing is constructed into cartridges which can be easily removed and replaced within seconds. Standard reactor cartridges are available in 2ml, 5ml or 10ml volumes, with smaller reactors advantageous in minimising reagent consumption when optimising reaction conditions. Vapourtec now offer a user rewindable 10ml cartridge. For more information on this please click here (links to Rewindable reactors tab). 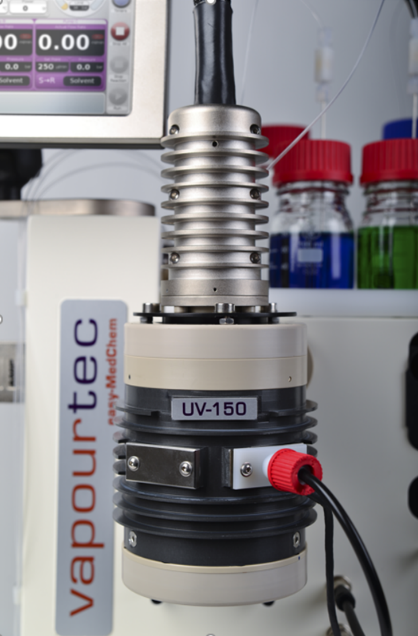 The compact design of the UV-150 photochemical reactor means it is much smaller than traditional photochemical reactors. In addition, there is no need for a large external recirculating chiller that has traditionally been used for cooling the lamp in other reactors. The compact design means that the UV-150 reactor occupies only one reactor position on the E-Series or two reactor positions on the R-Series. 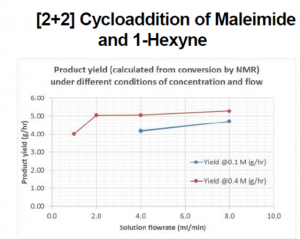 This allows the scope for completing multiple step (telescoped) photochemical reactions. Real time spectral data is a huge benefit in photochemical reactions. The UV-150 photochemical reactor offers an optional spectrometer allowing spectral intensity, wavelengths and reactant adsorption to be measured. The reactor is provided with a fixture to clamp a fibre-optic probe. This probe conveys light to a spectrometer for analysis. The position of the fixture enables the probe to ‘look through’ the reactor directly towards the lamp. This allows the relative spectral intensity of the reactants to be measured as the reaction occurs. 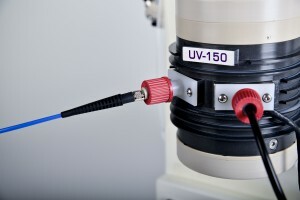 Vapourtec can supply a suitable fibre-optic probe and CCD Spectrometer if required. 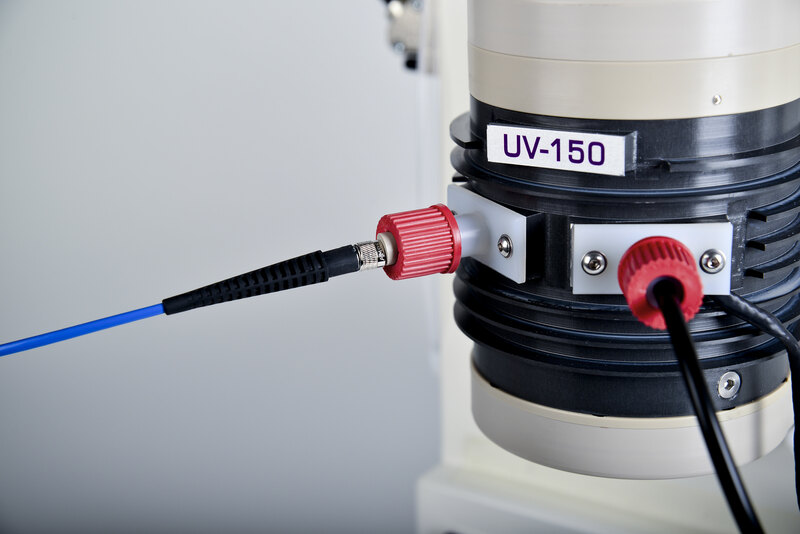 Safety is fundamental in the UV-150 photochemical reactor design. 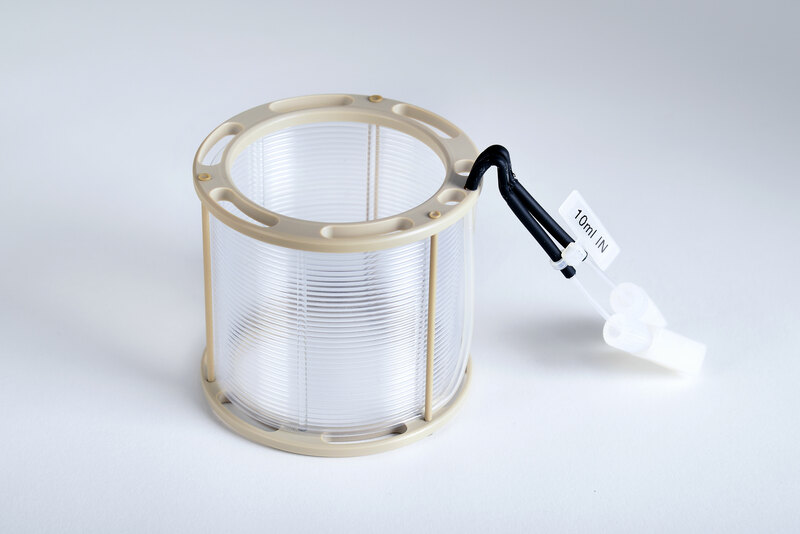 The light source is completely enclosed allowing it to be safely used in a standard laboratory fume cabinet without any additional light shielding. The power supply to the reactor is interlocked ensuring power is safely and automatically disconnected if the lamp become exposed. The forced ventilation system prevents build-up of flammable gases or vapours. Need more help with the UV-150 Reactor?